The title of this blog may shock you, and to be honest I found it quite shocking as well. Recent research shows how bad posture increases your rate of mortality. 1) Be conscious of your posture. Take notice of when your shoulders are rounding forward and when your head is out in front of your shoulders…and then correct it! Sit up straight! 2) Stretch the muscles that are tight and strengthen the muscles that are weak. Most commonly this means stretching your pecs, traps, biceps, hamstrings and hip flexors. Strengthening your rhomboids, core and glutes. If you need help with these specific exercises please let me know next time you are in the office. 3) Work with a chiropractor to keep your spine healthy and mobile. The people I see in my office almost always tell me they feel their posture has improved since getting adjusted, even though that’s not what initially brought them into our office. Chiropractors have been saying it for years. Posture is so much more than just how we look. It has everything to do with how we function and perform. 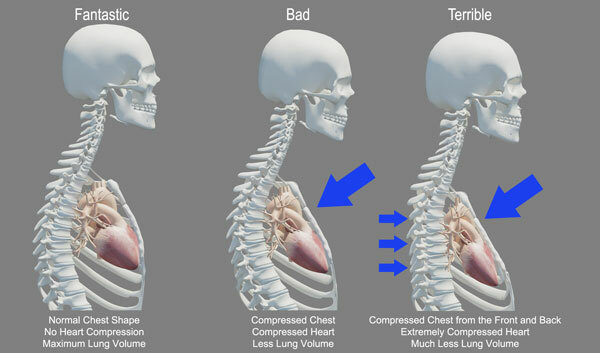 This study illustrates the importance between posture and overall mortality rates. Bad posture can literally, kill you. This entry was posted in Chiropractic and tagged adjustment, back pain, back pain relief, bad posture, best chiropractor in chicago, bourdage, bourdage chiro, bourdage chiropractic, chicago, chicago chiro, chicago chiropractic, Chicago. chiropractor. health, chiropractic and neck pain, chiropractic and posture, forward head posture, Headaches, health, health and posture, improve posture, kids and posture, low back pain chicago, massage therapy chicago, posture correction, sauganash chiropractic, sciatica, spinal health, wellness on September 9, 2015 by Dr. Bourdage.